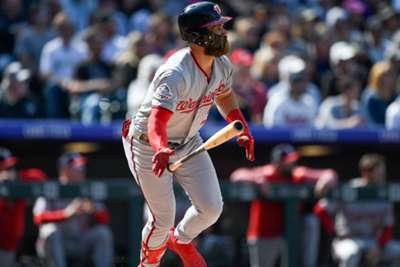 The New York Yankees appear unlikely to sign Bryce Harper as they eye Manny Machado, according to general manager Brian Cashman. Harper - who has spent all seven of his MLB seasons with the Washington Nationals - is a free agent. The six-time All-Star and 2015 MVP slashed .249/.393/.496 with 34 home runs and 100 RBIs in 159 games with the Nationals in 2018. But Harper is not on New York's list of targets, with the Yankees eyeing an infielder not an outfielder. "At no point all winter have I said I am looking for an outfielder,’" Cashman told reporters on Monday. "The Harper stuff … I am surprised you are still asking." The Yankees, however, have already had discussions with star free agent Machado's agent. Machado joined the Los Angeles Dodgers from the Baltimore Orioles during the 2018 season and helped the team reach the World Series before losing to the Boston Red Sox. "I have had several conversations with Danny Lozano about Manny Machado," Cashman said. "We are definitely focused in the marketplace in areas of need and he obviously is available and solves that area of need. So, not going to deny we have had a conversation or two."